This vintage-inspired photographic art shows colored balloons floating over New York City's Central Park. The world is an enchanting place when seen through the lens of photographer Ashley Davis. Here, she has captured an aerial view of the skyline of New York City surrounding the rolling green expanse of Central Park. The misty air and muted colors make it seem like a glimpse into yesteryear. And high above it all floats a flock of bright, candy-colored balloons. It's a moment of childlike wonder in a hectic, grown-up world. Available framed or unframed, the image is printed on photo lustre paper. Made in Fort Worth, Texas. In 2011, Ashley Davis rekindled her love affair with her camera and never looked back. She loves making pretty things to share with others, especially her whimsical, vintage style photography and her custom design. Comes framed and ready to hang, in a black BonanzaWood® frame, or unframed and matted with white FSC certified matboard, and Plexi. This is a wonderful photograph. It came promptly and looks exactly as pictured. It looks wonderful in my office - adds a little fun! I highly recommend it framed in white. 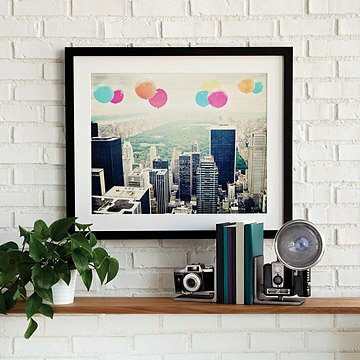 The print is nicely done and perfect for an office or extra room that needs a little color.